We will be a part of First Look Fair, which is scheduled to be held on Sept. 12-13 (Wed, Thurs). Come visit us for free swags! During the event, you will have chances to show off and speak about your internship or hear about different members’ internship experiences during the summer! We will be providing several boxes of pizza for you guys, so come hang out with us! 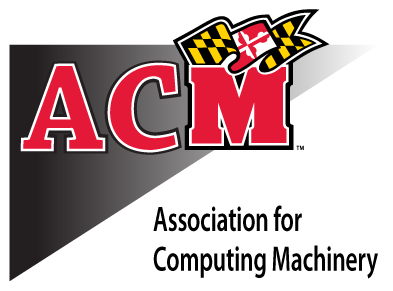 ACM is proud to present two-part workshops on technical and non-technical aspects of the interview & internship! In this Internship and Interview Workshop (Pt. 1), a guest speaker from Appian will be visiting to give a presentation on behavioral, general, and resume information about the internship & interview. While anyone is welcome to join, this presentation will be primarily geared towards those seeking an internship or a career in the tech field. In this Internship and Interview Workshop (Pt. 2), student instructors currently teaching the coding interview course (CMSC389O) will come join us to guide you through the technical interview. In the meeting, not only will you be learning about how to attack a coding question in general during the technical interview, but also you will learn what kind of questions to expect. In addition, you will be having hands-on experiences with those coding questions in the workshop, so be prepared for it! We will be having a movie night as one last fun before the spring break! The movie we will be playing is secret, but it is a Computer Science-themed movie! Come have fun with us one last time before the break!